Many of you will recognize the title of this article is a quote by Winston Churchill. It seems like many people in today's world live life by the, 'no pain...no pain' philosophy of life. In reality, it's still true for most people that life is lived by the, 'no pain...no gain’ way of life. In other words, before victory there is a battle; before resurrection, there is a cross; before day, there was a night. Author Phil Baker says, "Achieving in life is not just being in the right place at the right time, but also being in the wrong place at the wrong time and not giving up." People who persevere respond differently from other people. They don't look for an escape. They look for lessons. Their problems make them, not break them. Here is a quote by the all-time perseverance king. He was a guy by the name of Abraham Lincoln. "Success is going from failure to failure without loss of enthusiasm." When the crowd is small and isn't with you, that's when the real you comes out. That's when you define your life and your legacy. My friend, David Wheat of Axiom Advisers, says there are three axioms that his company is built upon. The first is your current circumstances are the product of a lifetime of choices and events. The second axiom is the future will be determined by the choices you make today and the events to come. Axiom three is the process is unending. Vance Havner said, "The alternative to discipline is disaster." The future is more about choice than anything else. Author Phil Baker goes on to say that we can easily make the mistake of thinking successful people just get out there and succeed. In reality, most just get out there and stay there through failure after failure. Most people check out too soon. 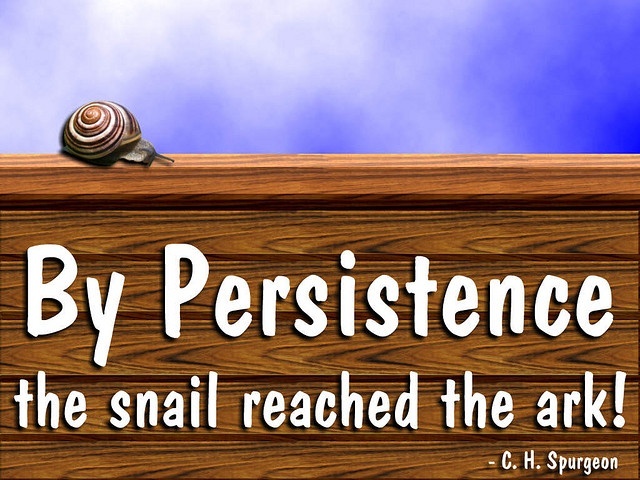 Said more simply, by perseverance the snail reached the ark. Finally, let me quote an inspirational writing for you from the book, the Pursuit of Excellence. This captures the concept of persevering for the right things. Let’s go back to the title of this article: Never, never, never, never quit! Perseverance is part of the character of God. If you tap into perseverance, you are tapping into a dimension of God that is unfathomable and uplifting. Sometimes we may need to give up on what we are currently doing in exchange for something much better. Sometimes good things fall apart so better things fall together. But never, never, never give up in the area of your will. Perseverance is not so much what you do but the willingness to keep on keeping on - on the inside - until you find what you are assigned by God to overcome. And think about this, God will never, never, never, never give up on you. He wants you in heaven with Him for eternity. And some of us are slower in the things of God than those snails getting in the ark. But that's OK, evidence shows there is a place on the ark for snails too!